Nero Wolfe is "a gourmet who never walks when he can sit and never sits when he can lie down." 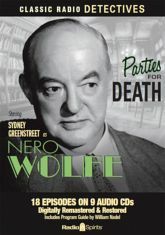 Join Rex Stout's reclusive, overweight, orchid-loving super sleuth as masterfully portrayed by Sydney Greenstreet in this exciting radio series. Ever in search of a perfect meal and a cold bottle of beer, Wolfe often sends Archie Goodwin, his secretary and operative (played by Wally Maher, Herb Ellis, Larry Dobkin, Gerald Mohr, and Harry Bartell), in his stead. Archie, while trying to keep his well-known weakness for red heads in check, follows up on leads and does the leg work, setting up his brilliant boss to solve the case. Learn the logic of this armchair detective extraordinaire as he presides over 18 digitally remastered cases of treasure maps and love triangles, carelessness and con artists, bad business and bad medicine.